We hit day 3 of the 25th Mining Indaba in Cape Town – there has been so much happening it really feels like a marathon compared to a sprint here in Cape town. Delegates are spoilt for choice with the number of presentations and networking opportunities, all focussed on how to take mining to the next level. Speeches and interactions are all very well and many are highly inspirational, but action and action alone can make a difference in people’s lives. Mining companies understand this better than anyone just as the government of South Africa does. Yesterday, H.E. President Cyril Ramaphosa called for action in making mineral beneficiation in the South African Development Community (SADC) more of a reality than a mere rhetorical exercise. Today, after a session in the exhibition arena, the Minister of Mineral Resources whispered to this MiningIR writer: “Don’t study for ever. Implement what you have been studying now!”, advice I am willing to put into action! The scale and volume of the exhibitions present in Cape Town this year often drown out the words being spoken. Many companies were very creative and put together a quality exhibition that says it all. One can see that mining companies have at their heart people who state that they are environmentally conscious, and we must acknowledge that mining CAN have a destructive impact on the environment if there is no regulatory body which has the strength to enforce the law in a very transparent way. There are companies that put a green landscape around their stand while what they do has nothing to do with green mining or environmental consciousness. There are however many companies who demonstrate by their stalls or stands that they mean business and try to do things in a way that reduces the environmental risk significantly. A lot of things happen in these exhibitions. I saw H.E. Minister Jeff Radebe of South Africa stopping for selfies with people who asked for them. You might think is just a PR exercise, but actually this is entirely in the spirit of the ‘Batho Phele’ principle, meaning ‘people first’ and Ubuntu (humanity) as cherished by the government of South Africa. 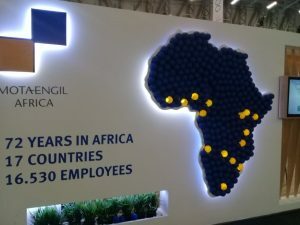 The displays, exhibitions and actions at Indaba have demonstrated to some extent how kind and value-centred some of the companies present are. In one instance companies were giving coffees, teas, quality pens, bags and a range of presents that delegates were really enjoying. There are hundreds of publications, journals, magazines, official reports and news letters available for anyone to pick up. This mega-conference really means business. While certain people are here for business others are here to learn. University students conducted research and others learnt by interacting with business specialists. Journalists and business people have a special area in which to do their work, interpreters and other specialists are free to make use of their abilities. Freedom of expression is not a problem at the Indaba at all and this is reflective of a democratic South Africa that welcomed the event. Just as the sunny and beautiful Cape Town is bright, so the future of mining augurs new opportunities for networking and engagement with individuals, companies, and governments. Previous articleIronRidge Resources ‘pleased with progress’ at Cape Coast Lithium project in Ghana.